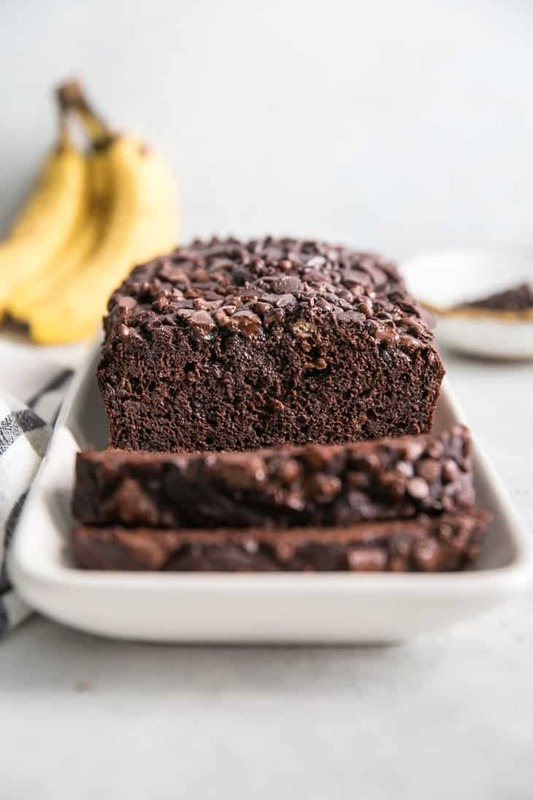 Healthy Chocolate Banana Bread that is sweetened with bananas, maple syrup, gluten-free friendly and loaded with chocolate chips! Dairy free banana bread recipe. 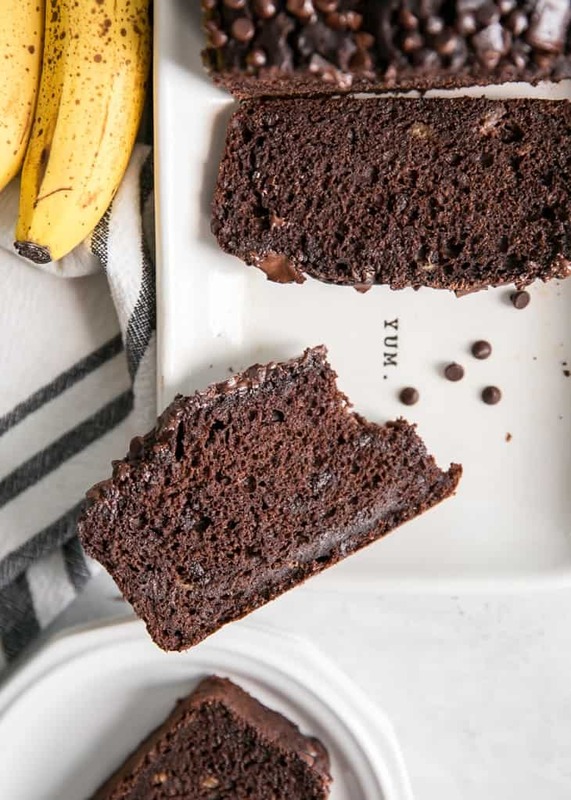 So this double chocolate banana bread is kind of amazing. One could argue this would be suitable for breakfast… or perhaps a healthy dessert. Either way it’s best you add this to your baking list as soon as possible. 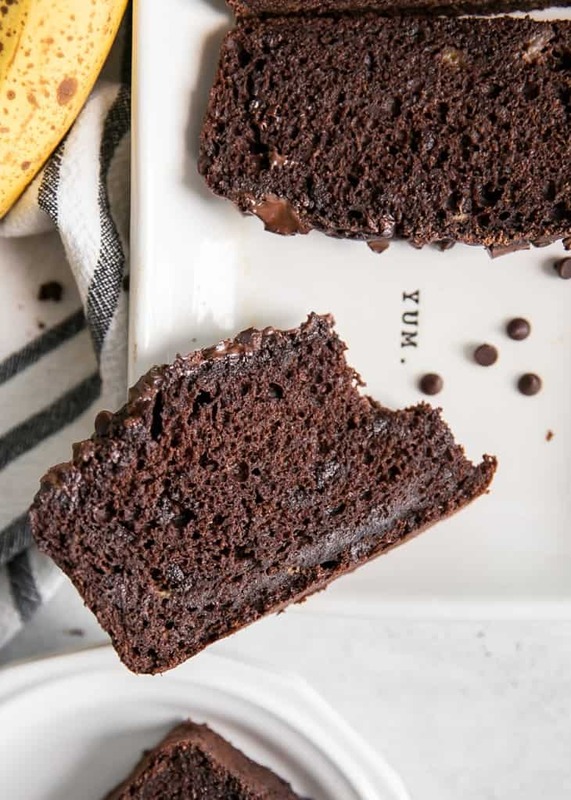 This chocolate banana bread is very similar to these banana muffins and this carrot cake banana bread, but with some of the flour omitted to make room for the unsweetened cocoa powder. Once you have a recipe like a classic banana bread down and you’re familiar with substitutions, making variations is fun (and delicious). With muffins and quick bread recipes using whole grain flours, it’s a good idea to mix together the dry and wet ingredients separately. This will ensure the ingredients are incorporated properly and the texture of the bread stays soft. There is a reason I write the directions in a certain way, so it’s best to stick to the steps as written. Note: You can use an electric mixer or mix everything by hand with whisk and spatula. First you’ll mix the dry ingredients separately and then set aside. Next you’ll begin to incorporate the wet ingredients by starting with the (well) mashed banana, maple syrup, oil, vanilla and eggs. Then you’ll begin to slowly stir in the flour and gently add the milk to combine everything together. 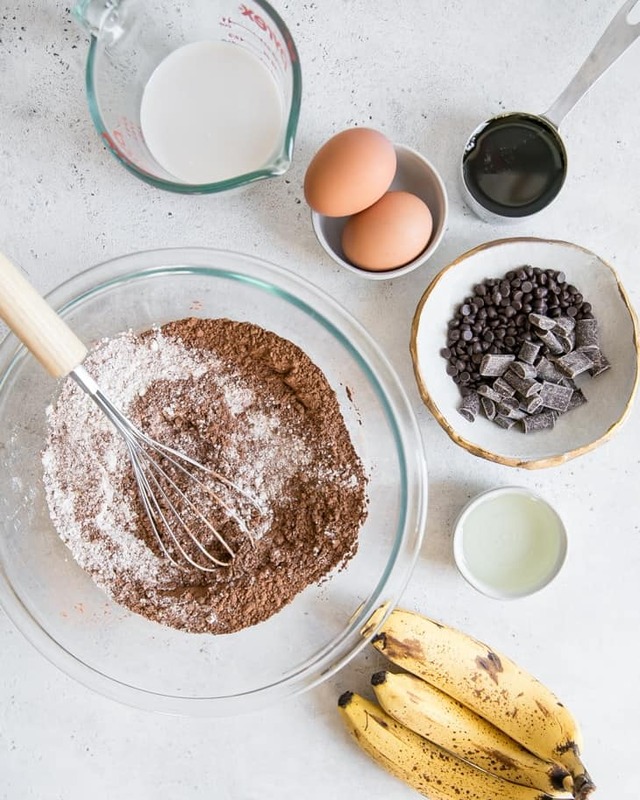 You can stop mixing when there are just bits of flour remaining, because everything will get fully mixed when you fold in the chocolate chips. Flour – This recipe was tested with both 1:1 Gluten-Free Baking Flour and Whole Wheat Pastry Flour. You can also use half whole wheat, half all-purpose. All whole wheat white flour will also be fine, just slightly more dense in texture. Sweetener – Maple syrup is the main sweetener here. You can also sub agave, honey and likely date syrup. I found I preferred the taste of this chocolate banana bread with an additional 1/3 cup of granulated sugar (i.e. cane, Swerve or coconut) but if you don’t have much of a sweet tooth, the added chocolate chips may be enough. Making sure you use really spotty bananas (black even) will help with not needing any additional dry sweetener. 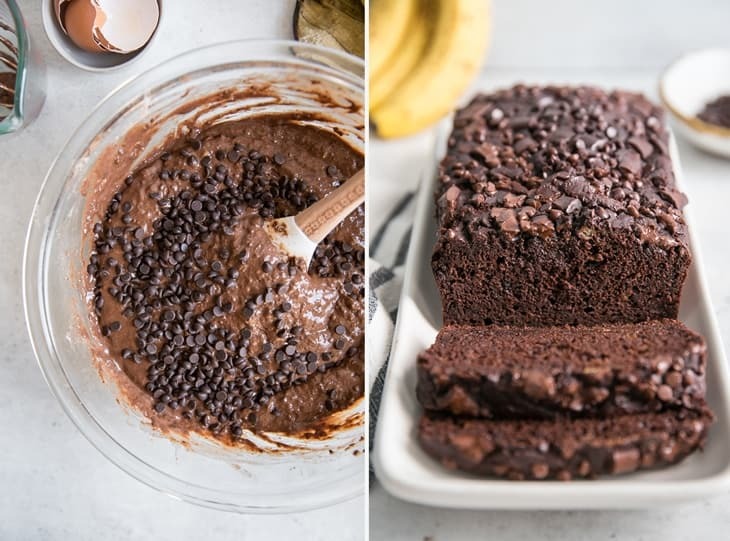 Bananas – I did not test this with applesauce (it’s banana bread, duh) but if you’re short on bananas, you should be able to make up the difference with applesauce, more oil, or yogurt. For example, if you only have 3/4 cup mashed bananas just add 1/2 cup applesauce. Or greek yogurt. If adding oil I think you’d only need 1/2 cup total (not in addition to what’s already called for). Banana bread recipes are often forgiving if you know how to substitute different wet ingredients into the mix. Eggs – I did not test this recipe to be egg-free yet, but seeing that this recipe is adapted from the Simple Banana Muffins and Carrot Cake Banana Bread, you should be fine to use 2 TBPS flaxseed meal mixed with 6 TBSP water, let sit to gel and add as noted in recipe card where you’d add the eggs. Can you make this bread into muffins? This recipe will yield about 15 regular-sized muffins. Simply fill your muffin pan about 3/4 way full. Bake at 375ºF (a touch higher than what is used for the bread) for about 20-25 minutes. Every oven is different so you could even check at 18 minutes. Use the toothpick method. If the inserted toothpick comes out with wet batter, add another 3-5 minutes. Mine took 23 minutes. Let me know if you try this recipe by leaving a comment and review below the recipe! I love hearing from you and it helps others find the recipe too! 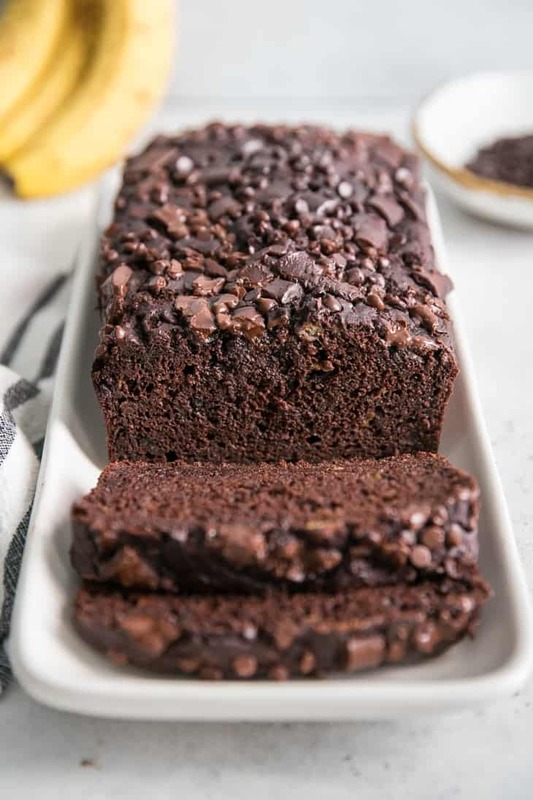 Healthy Chocolate Banana Bread made with whole grain flour, gluten-free friendly, sweetened with bananas, maple syrup and chocolate chips. 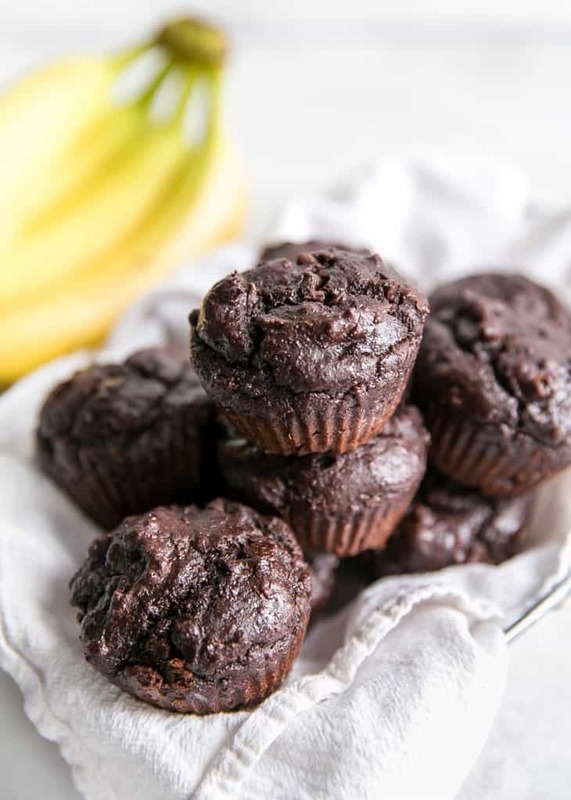 Dairy-free recipe and also makes about 15 muffins! Preheat oven to 350ºF and line 9×5 baking pan with parchment paper; set aside. In a medium bowl mix together dry ingredients; set aside. In a large bow whisk mashed banana, maple syrup and oil until combined. Whisk in eggs and vanilla until combined. Begin to add about half of the dry ingredients to batter, gently stirring. Then pour in milk and rest of flour and stir until just combined, then fold in chocolate chips. Be careful not to over-mix, especially if using whole wheat flour. Pour batter in lined pan and add more chocolate chips/chunks for topping; bake for 45-55 minutes. Cover bread with foil at 25 minutes. Check bread at 45 minutes. Inserted toothpick should come out clean (no wet batter, crumb is okay). My bread took 50 minutes, uncovering for the last 5 minutes. Allow bread to cool in pan on wire rack completely before slicing. Store bread at room temperature or fridge in covered container, about 3-5 days. *If using whole wheat pastry flour, whole wheat white or half all-purpose and half whole wheat, use 1 1/4 cups flour. To make muffins: fill muffin pan 3/4 full with batter – I got 15 muffins. Bake at 375ºF for 20-25 minutes, until inserted toothpick comes out clean. To make egg-free / vegan: You can likely sub the eggs for flaxseed meal. Use 2 TBSP flaxseed meal + 1/3 cup water and sit for 4-5 minutes. I did not test this way but this method works for many of my quick bread and muffin recipes. Let me know if you try! yaaaaas to all those chocolate chips! Can’t do chocolate bread without chocolate chips!! Made muffins with this recipe yesterday and they were delish! I have a 4 year old and a 2.5 year old and the muffins were gobbled up right away! Such a great a healthy after school snack! Ah yay! Thanks so much for leaving a comment and review Erin! ☺️ Glad the girls liked them. Wow! This looks fabulous!If I wanted to use almond meal/flour, what would you recommend for the exchange? Also, I plan on using only erythritol. Any thoughts? Hi Heidi, I would probably use 1 1/2 cups of almond flour here. And I don’t typically bake with erythritol but it would likely work. If the batter seems dry (because of replacing a liquid sweetener with a dry) then add a couple tablespoons of milk and see how it is. Hope that helps. Would love to hear back if you make! Used almond flour – took a bit longer to cook but it’s divine! Awesome! So glad the almond flour sub worked out for you here. Thanks for the comment and review! Super yummy and quick to make! I used Bob’s Red Mill Gluten Free 1:1. I used REALLY ripe bananas and it came out perfectly. Mine cooked a lot quicker than yours – maybe only 40 minutes. I would definitely make this again. Awesome, Lennie! Thanks so much for sharing feedback and reviewing 🙂 Glad you liked! I’ve followed you on Instagram for a couple of years, but (shamefully) this is the first recipe of yours that I’ve tried making. 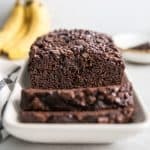 My husband and I LOVE this chocolate banana bread!!! I used honey and 1/3 cup sugar for the sweetener instead of maple syrup and it is the perfect amount of sweet; I think the honey brings out more of the banana flavor, but it still tastes so great! The bread is incredibly moist and the chocolate chips inside are my weakness. Thank you for a great recipe! I’m so excited to bake with more of your recipes!